Ramapo President Peter P. Mercer made the introduction, lauding Judge Vichness for his commitment and many years of service to the judiciary in New Jersey. “I thank Judge Vichness for his willingness to come to Ramapo to speak with our students, staff and faculty on this very timely subject,” said President Mercer. Addressing, in particular, the students, Judge Vichness explained the “very formalized” legal steps of changing one’s name in New Jersey, calling it a process that required patience and careful planning. 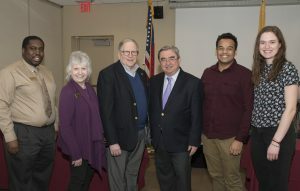 A panel discussion with students and staff who have experienced elements of the name change process followed the talk, which was sponsored by the Civic and Community Engagement Center at Ramapo. Judge Vichness was appointed to the Superior Court in 1995 and during his 18 year tenure, served in all of the divisions of the Superior Court. He stepped down in 2013 and joined a private firm as counsel the same year. During his tenure on the bench, he served in the civil division where he was the Business Court Judge presiding over commercial and complex matters. He was involved in the management, trial, and settlement of various medical malpractice, construction and personal injury cases. While on the bench, Judge Vichness served as a member of the Supreme Court Committees on Judicial Education and Jury Selection in civil and criminal trials. He also was a frequent lecturer at the New Jersey Judicial College. Since leaving the bench, Judge Vichness has served as a mediator and arbitrator in a wide range of cases including construction cases, personal injury cases, medical malpractice cases, contract cases and probate cases. President Mercer also thanked Board of Trustees member Sharlene S. Vichness for facilitating the Judge’s appearance. “Trustee Vichness continues to be an advocate for Ramapo. We thank her for her wonderful contributions and service to the College,” said President Mercer.